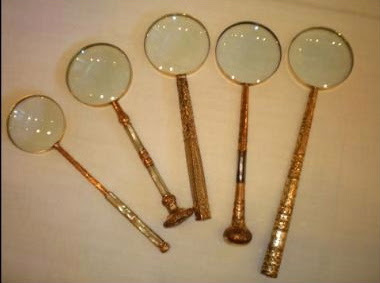 Above, magnifying glasses have 14-karat gold Victorian parasol handles; Below a sampling of accessories and furnishings available at Suzan Fellman Showroom. 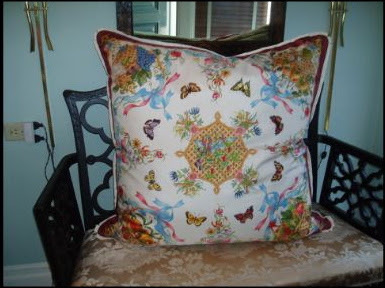 Today lovely Megan, over at Beach Bungalow 8, wrote about yet another chic L.A. home-furnishings boutique: Suzan Fellman Showroom, specializing in vintage chinoiserie. I had to spread the word. 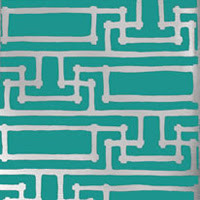 BTW: Dawn Jacobson's Chinoiserie is still the best book I've found on the subject. Does this silver giraffe remind you of a certain charismatic potter-designer's long-necked creature? My friend who owns the Atlanta boutique, Providence, found the little 1970s guy at Scott Antique Market. We think it looks a bit like a precursor to Jonathan Adler's iconic animals. 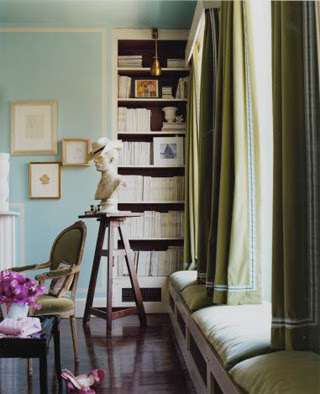 Above, India Hicks' dining room photographed by Arthur Elgort for Vogue; Sittings Editor, Hamish Bowles. "There are no rules in decorating," Margaret Russell once said. 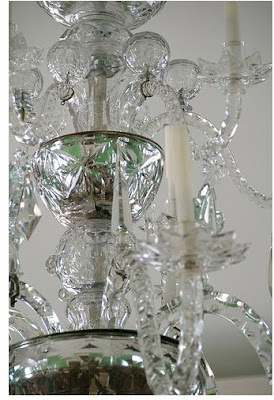 Decorators do tend to contradict each other -- and themselves -- quite often. I've noticed this after years of reading design books and shelter mags. Currently, some opposing views are presented in Domino's August issue; editors constructively share diverse opinions from top designers and look for areas of agreement. On page 53, the hot button topic, "where to put the family photos," is tackled. Sixty percent are vehement about keeping the pictures in private areas and forty percent say "display tastefully." (Tastefully being subjective.) 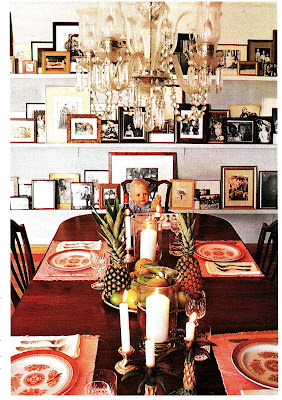 So, I couldn't resist posting this image of India Hicks' fabulous, family-photo-laden dining room. Hicks says that her dad, legendary David Hicks, advised never hanging photographs. Hence the shelves. She does have her black-and-white pictures grouped together, but otherwise India seems to prove that, in decorating, flair trumps the rules. 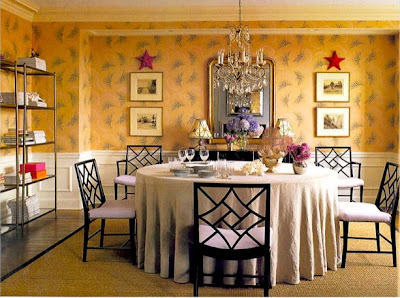 Above, Windsor Smith's dining room photographed by Miguel Flores-Vianna for Domino, August 2007. Need to make room for a fabulous new cabinet or chairs, like the pieces above from Windsor Smith's debut furniture collection? Consider donating your gently used furnishings to an organization such as the Furniture Bank of Metro Atlanta. When this non-profit picked-up a large cabinet from my home, things went seamlessly. Donated items go directly to people seriously in need of furniture: women and children who've fled domestic violence, formerly homeless families rebuilding their lives, the medically fragile. 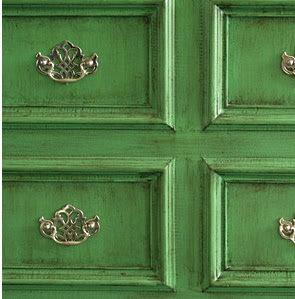 Some of the most needed pieces are beds, dining tables, sofas and storage cabinets. A complete list of accepted furnishings is provided on the Furniture Bank's site. 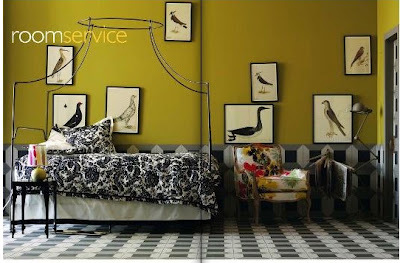 Photography above, Pieter Estersohn for Southern Accents; interior design, Michelle Nussbaumer. 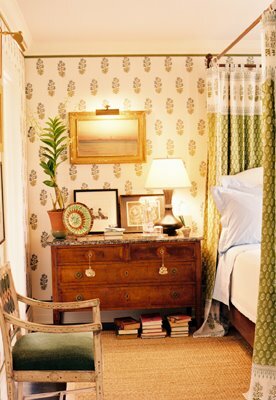 Below, Windsor Smith's bedroom photographed by Miguel Flores-Vianna for Domino, August 2007. When I first saw Windsor Smith's seersucker-clad bedroom in a Domino video, I was reminded of Michelle Nussbaumer's striped oasis. 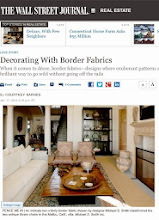 It's interesting that both decorators have ties to Texas and California, and both effortlessly mix exotic bohemian elements with tailored, stately pieces and dashes of Hollywood Regency. Rug above is available through Dash and Albert; rug below is from Wisteria. 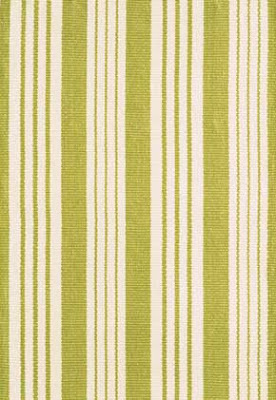 A reader contacted me in search of a bold striped dhurrie rug similar to the one seen in the island home of Bunny Williams and her antique dealer husband, John Rosselli. (Shown above in Fritz von der Schulenberg's photo for Town & Country.) Wisteria and Dash and Albert offer these in great color combinations. 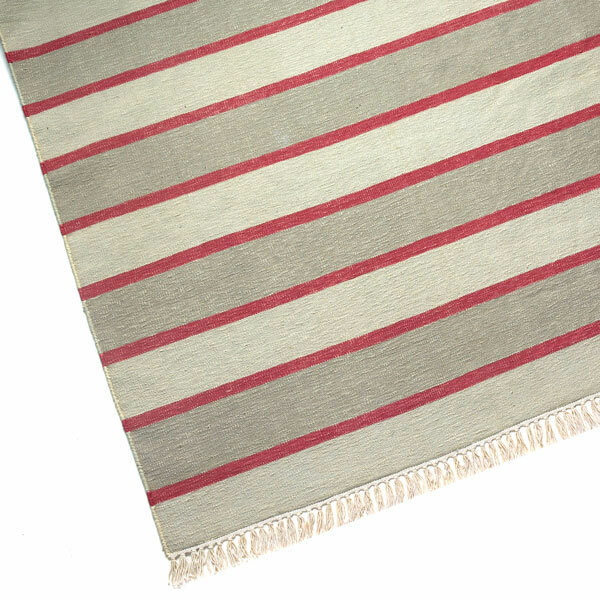 The flatwoven rugs are reversible and said to be highly durable. Thanks friendly reader, CSS, for the Dash and Albert reminder! 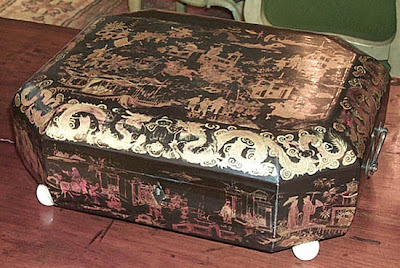 This red-lacquered cabinet is currently on sale at The Silk Trading Co., Atlanta. 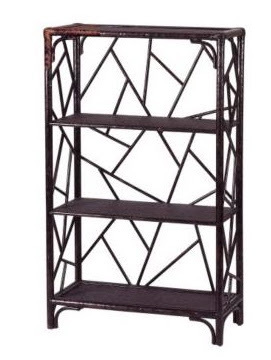 I love the fretwork and slim proportions -- perfect for a small space. John James Audubon: Drawn From Nature, a documentary about the artist who spent 18 years painting life-size portraits of every bird known to exist in the United States in the early 19th century, begins airing on most PBS stations tomorrow, July 25. Looks fascinating. It's interesting that Anthropologie currently has a series of bird prints inspired by drawings from 18th century traveling biologists, shown above. 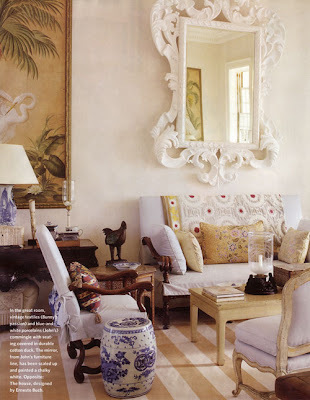 Interior design, Mary McDonald, as seen in House Beautiful, October 2002. 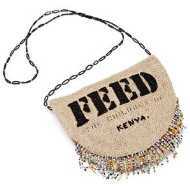 Less expensive, not-so-old options can often be found at flea markets and through online shops such as Wisteria. 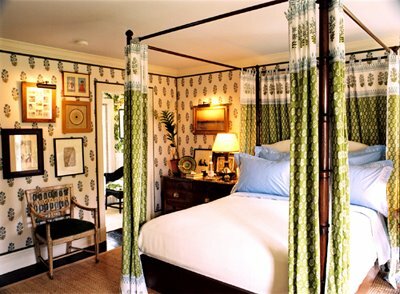 Bedroom above -- a personal favorite -- designed by Peter Dunham, with a liberal use of his own textiles, for House Beautiful's Celebrity Showhouse, 2003. Recently, I discovered a nice House & Garden podcast featuring Peter Dunham. The interview is lovely. Definitely worth a listen. 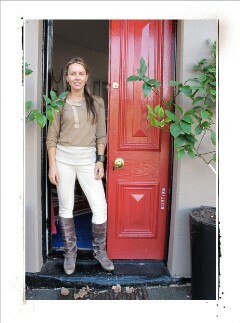 If you have iTunes access, go to design podcasts, then look for the House & Garden series. A budget-friendly alternative to antique bamboo furniture, Ballard's Mandalay Bookcase is inspired by Chinese-Chippendale pieces. The wood and rattan frame has been given a finish that resembles vintage tortoise-shell. $299. 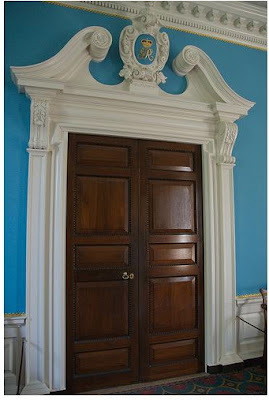 For more on Chippendale, see Harewood House, and Celebrating Thomas Chippendale, 250 Years of Influence. 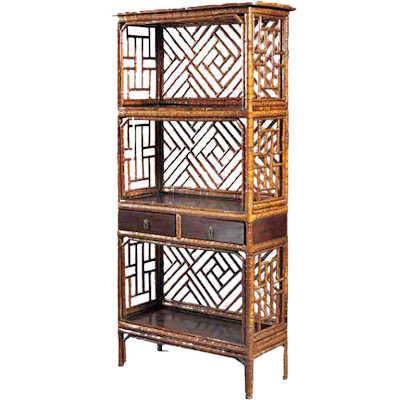 This mid-19th-century bamboo Chinese bookcase, from Florian Papp, is price upon request, but I love the fret work (Chinese lattice). I'm thrilled by the response to my online book club proposal. Why don't we start discussing Florence Broadhurst: Her Secret & Extraordinary Lives on Monday, August 13? 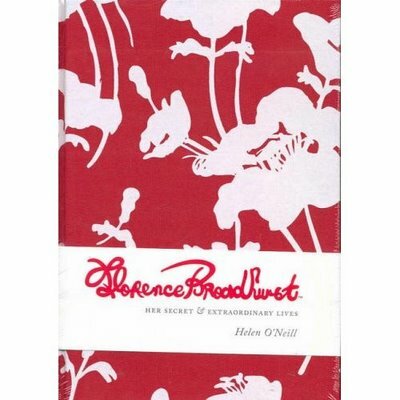 I've finally begun reading Florence Broadhurst: Her Secret & Extraordinary Lives, from Chronicle. If you've read the book -- or want to -- let me know. In August it might be interesting to have an online book club discussion. With Broadhurst's complicated life story, and the mystery surrounding who really designed her vibrant Asian-inspired wallpaper, there is plenty to talk about. 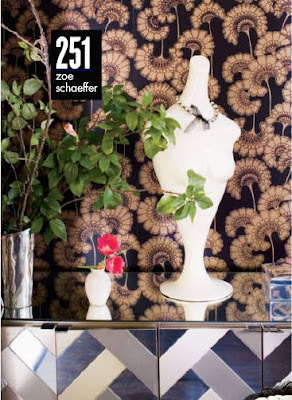 Above, designer Ruthie Sommers recently used Broadhurst wallpaper in the home of L.A. boutique owner, Zoe Schaeffer. Photography by Grey Crawford as seen in Elle, April 2007. Above, Sara Ruffin Costello created graphic impact on her shelves with the repeating white spines of magazines. Photo by Paul Costello, as seen in Domino. Above, Anne Coyle stacks her numerous magazines in plain view and incorporates them into her interior design -- even in the dining room, as seen in Elle Decor, March 2005. Photography, Francois Dischinger. The other day, Anna Spiro asked me if I hang on to all my old design magazines or tear and file the best pages. Unfortunately, the rough edges on many of my posted tear sheets tell the answer. (Sometimes X-acto knives fail.) For me, space dictates what I can keep. So, on shelves I allot room for seventy magazines and seven notebooks brimming with hundreds of tears. Suzanne Rheinstein, Ruthie Sommers, Carolina Irving and Lisa Fine. Of course, my digital files are constantly growing too. I love being able to quickly find a specific room. 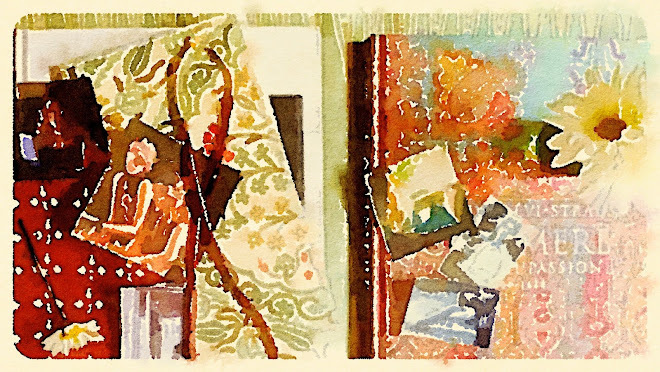 An antique dealer friend of mine has a more artistic approach: she fills inspiration albums with collages of her favorite interiors. But Anna Spiro says she can't stand to rip-up her mags. How do you organize your magazines or tear sheets? Above, Moss's red-leather-bound volumes of Vogue, photographed by New York Social Diary. BTW: Sam Flax Atlanta, the brick-and-mortar art supply store located at 1460 Northside Drive, has a great selection of cloth-covered binders and magazine holders in bright colors as well as neutrals. For updated posts on tear sheet storage, click here. An antique dealer friend of mine found this framed wallpaper sample in Europe. She was told it's Parisian, 1920s. Regardless of its pedigree, I love it. If you rent, or for other reasons are unable to make major changes to your walls and floors, it's pretty satisfying to focus on tablescapes and strong pieces; basically draw the eye to the best elements. 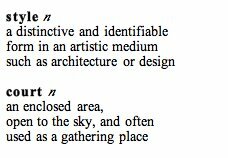 I've become strangely obsessed with figuring out how my favorite pieces could work in different settings down the road. 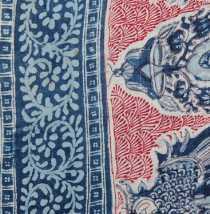 For more images of vintage wallpaper, textiles, ornament, and pattern, see my past post, New York Public Library Digital Gallery. Framed wallpaper sample, above, is from Providence in Atlanta. 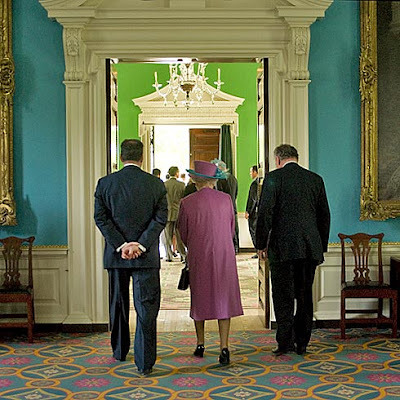 To some visitors, the clear bold colors inside the Governor's Palace at Colonial Williamsburg look a little more "now" than 18th century. But actually the Colonial Williamsburg Foundation has gone to great pains over the last few decades to accurately reflect the Georgian era -- its society and aesthetics. 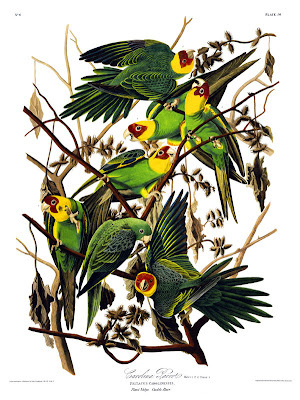 So gray-blues, somber greens and murky golds were banished in favor of apple-greens, turquoises and sunny yellows. (The colors scholars now believe are true to the period.) 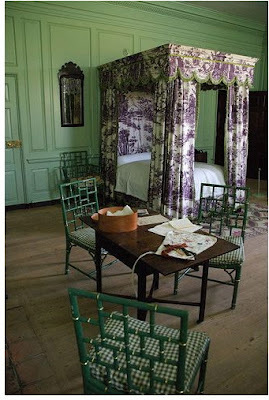 I was struck by the green Chinese-Chippendale chairs in the bedroom above. This is such a "decorator-ish" comment to make, but can't you see them at Viceroy Santa Monica sans gingham cushions? 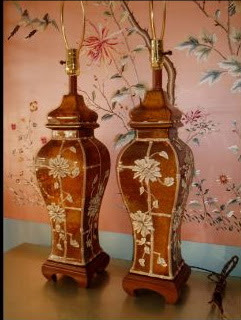 A few years ago, Charlotte Moss imagined this chinoiserie bathroom for Elle Decor. 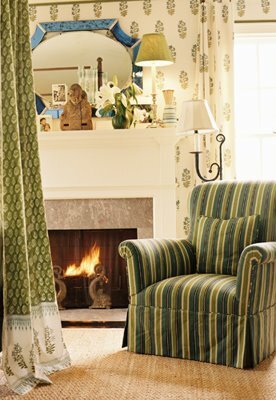 Some of her inspiration came from that earlier arbiter of English country-house chic, Nancy Lancaster, who was known for furnishing baths like "real rooms." Hence the Regency-style bamboo caned chair with ottoman, French-style end table, and twin sinks dropped into a French cabinet. Although this bath is roomy, several of Moss' elements could work well in a tiny space: the graphic wallpaper, ("Treillage Sidewall" from Brunschwig & Fils) the tailored window shade, ("Mikado Blue" cotton from Christopher Norman) and the black tole lantern. 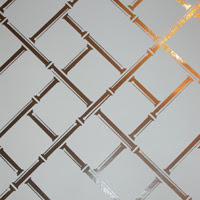 Below are two great geometric wall-coverings from Walnut Wallpaper, "Bamboo on Mylar" and a Florence Broadhurst pattern, shown last. 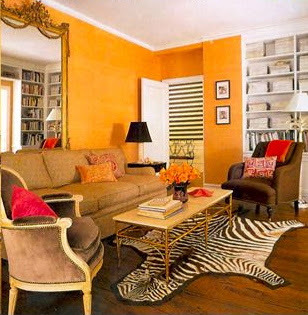 Interior design above, Tom Scheerer, as seen in Elle Decor. 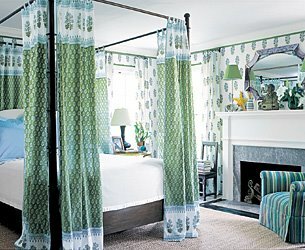 I suspect Tom Scheerer has few clients who sew their own curtains or silver-leaf a king-size four-poster bed, but that's what Melissa Sellars did, according to Elle Decor. Her ethereal bedroom really proves that, with a sophisticated eye and restraint, a little D.I.Y. can yield supremely elegant results. Apart from the D.I.Y. aspect, I think this room is intriguing because elements usually associated with American Country style -- the Shaker-style bed, the tall secretary -- were given a glamorous makeover, then paired with a few modern pieces, and it all works. Shown above is Sellars in her Brooklyn townhouse, with her son and his friend. 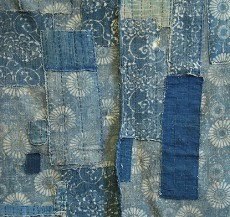 A reader is trying to locate the small open woven piece under the side table (behind the boy with guitar). I no longer have the whole issue -- only these tear sheets from Elle Decor. It was a holiday issue from, I think, six or seven years ago. Does anyone know more? 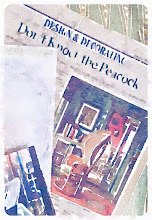 A very kind reader, Katherine, sent me this message regarding the past holiday Elle Decor issue, "I have it!! It's the Dec./Jan. 2001 issue. I saved it specifically for this article! ... It appears to be a stool as it is closed on top. Unfortunately, it is not credited in the article or resources."